Here in Greece, it is hard not to notice that the Greeks are angry at their government, which can only prevent a state bankruptcy by taking desperate measures. For example, people can no longer retire in their mid-fifties. They will have to work longer, even when they have a right to an early retirement. Or another case: many people working on the archaeological sites haven’t received their wages for twenty-two months. I do not know to what extent the situation is comparable to my own country, where I find some economic measures hard to swallow because the people who have gotten us into this mess have remained unpunished: the CEOs, the bankers, a couple of politicians, a handful of accountants, a lot of economists. To some extent, I can sympathize with the angry Greeks. This morning, the inevitable happened: we found an archaeological site closed. 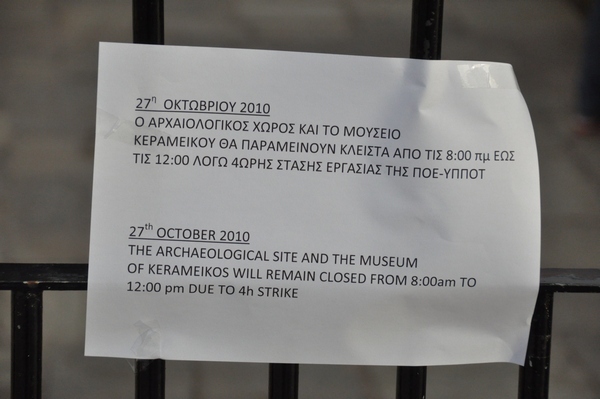 Everyone at Kerameikos was on strike. I should probably count my blessings that this afternoon, they will reopen the museum and the excavation. Yet, strikes create victims – and it is a stupid to focus on foreigners. They won’t influence Greek public opinion for the strikers, but can influence foreign public opinion against Greece. Targeting foreigners is not only stupid, it is also ungrateful. After all, to keep the euro stable, the other member states have had to offer loans to Greece, and this money must come from somewhere. This has added to the problems in northwestern Europe. My parents could benefit from a pension when they were sixty-five but I will probably not be able to retire before I am sixty-eight or sixty-nine, partly because of the Greek bail out. It has long been known that my generation has to pay for the babyboom and I have learned to live with it sometime in the late nineties, so it’s fine with me, but I think the Greeks cannot reasonably ask that they can retire at fifty-eight when this means that others have to work until they’re sixty-eight. As a historian, I want to have access to the sources I may need for my research. It is not the task of a government to select what I am allowed to see and what I am not allowed to see. Since we are all interested in history – it is not the privilege of a small class of scholars – access to historical sources has to be free to all people. Of course there are documents that need to be secret for some time; they are usually declassified after, say, fifty years. So far, so good. The Dutch Royal Library is currently making available online all newspapers from the Second World War, which includes Nazi propaganda. Now the Dutch department of Justice has advised the library not to make digital versions of these publications, because it is possible that the Public Prosecutor might accuse the Royal Library of distributing publications that incite hatred. This creates lots of problems. In the first place, “improved versions” will start to circulate. It is already possible to download versions of Mein Kampf that lack certain key passages, making it look less dangerous than it was; or alternatively, sections may be added to make it sound more convincing (compare the fake translations of the Cyrus Cylinder). If you want to neutralize the dangers of National Socialism, show the beast, don’t hide it. In the second place, where to draw a line? If we allow that our governments discourage historians (professional or amateur) to study National Socialism, what’s next? Stalin? Lenin? Marx? Christian and Islamic texts about Jews may be the next target. However, there is no need to hide sources from the public. 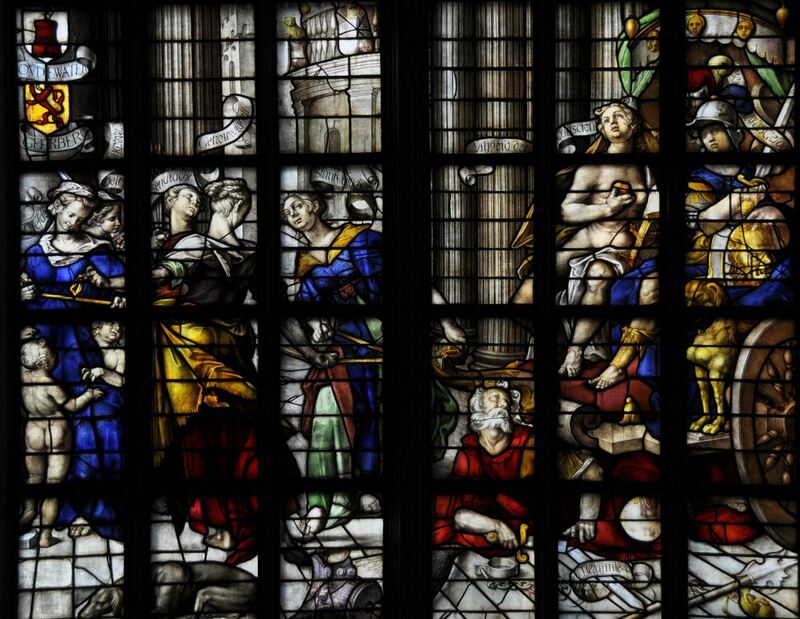 What the people of the Dutch Justice Department appear to be unaware of, is that the majority of people is reasonably capable of critically reading historical texts – placing remarks in context and understanding a debate about it. Of course, the Dutch universities have remained silent. It’s holiday, and who cares about censorship?